V soseščino sta prišla dva mala ljubka otročička. Benjaminu in Julijanu želim vse lepo na njuni življenjski poti. Za izdelavo voščilnice sem uporabila zame brezčasno Mo Manning štampiljko, ki sem ji prilepila še zrcalno sliko. 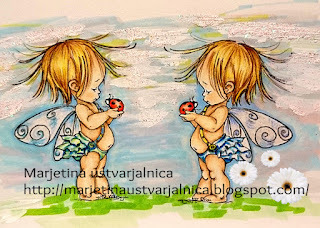 Pobarvala sem ju s Prismacolor barvicami, ozadje pa sem naredila s pomočjo promarkerjev in gessa. Še nekaj rožic ( I am a rose) in rezalnih šablon (Tattered Lace, Nellies, Spelbinders) in voščilnica je bila narejena. What an adorable image and beautifully colored. Love all the embellishments. Thanks for joining the Crafting With An Attitude challenge. So very cute! Love your coloring! Thank you so much for joining us at Allsorts challenge this week! A very sweet creation, many thanks for joining in with our 'Boy's to Men' theme at Allsorts challenge. Beautiful card, love the way you used the images to look at each other and the beautiful colours. How fantastic. It's a super card and such wonderful colouring.Thank you for coming along to play at IKEsWORLD Challenges. A super image and wonderful colouring. Thank you for joining our 'Boys to Men' challenge at Allsorts. Kako sta ljubka. Strašno simpatična vošščilnica. 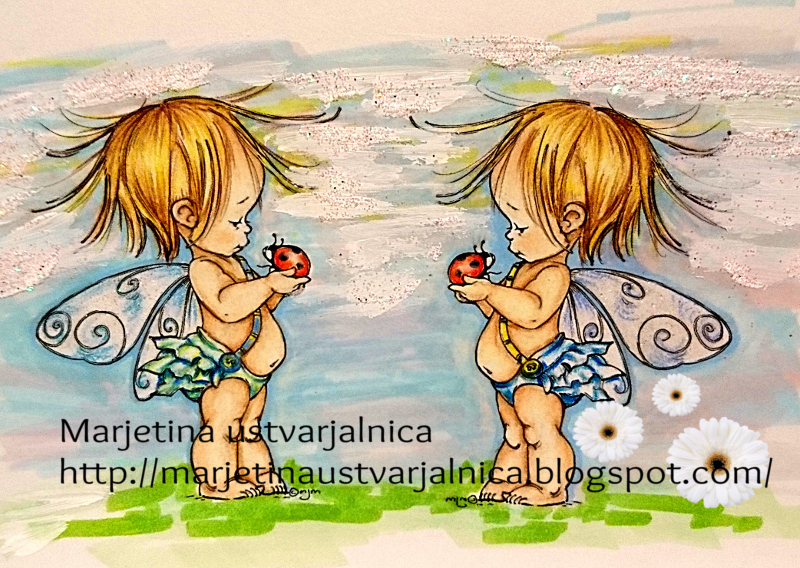 So adorable and you made them into twins...gorgeous card.. Thank you so much for joining in with our challenge at Sasayaki Glitter..
A very sweet card - congratulations! Thank you for coming along to play at IKE'sWORLD Challenges. A fabulous card Marjeta, such a beautiful image. This is adorable! Love the design with the cuties facing each other. So perfect for the little guys! Thanks for joining us at Sasayaki Glitter this month!